Blue/Black Vail Water Colorant | Valox Ltd.
For use in controlled waterways Non-toxic and safe for fish, humans, and birds Requires only one-fourth as much compared to other dyes. Super-concentrated water colorant that’s as friendly to animals and fish as it is to the eye. Requires only one-fourth as much compared to other dyes. 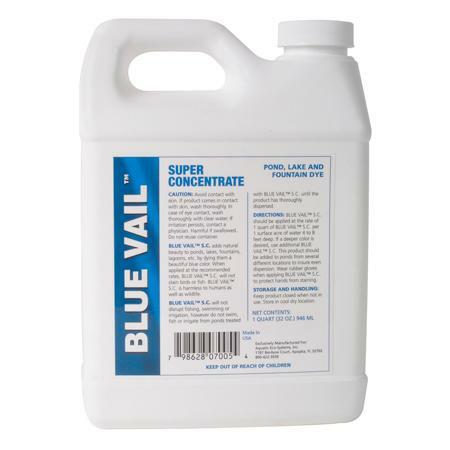 Blue Vail turns water to a sparkling sapphire blue, ideal for fountains, water features and ponds. Use Black Vail to turn water a mirror black, simulating clear dark bottomed lakes. For use in controlled waterways like private ponds and lakes. 1 quart treats 1,000,000 gallons of pond water for up to four months. (One quart is equivalent to one gallon of other brands).